Commander Howe is a native of McMurray, Pennsylvania and graduated from Carnegie-Mellon University in 1998 with a Bachelor’s of Science degree in Political Science. 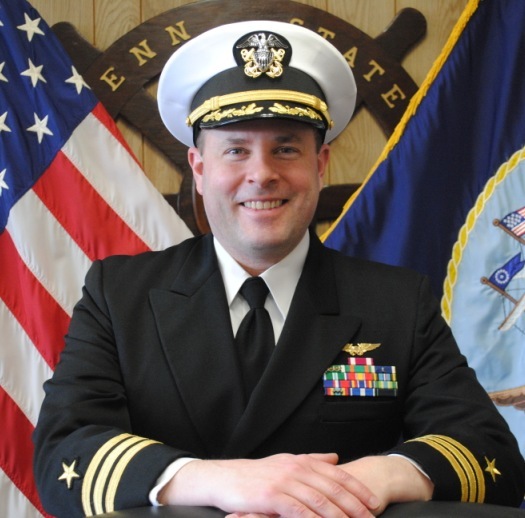 He received his commission through the Naval Reserve Officer Training Corps and was designated a Naval Flight Officer in 2000. Commander Howe reported to the “Pro’s Nest” at VP-30 in NAS Jacksonville, Florida for initial training in the P-3C Orion. His first operational assignment was with the “Tridents” of VP-26 at NAS Brunswick, Maine from December 2000 to April 2004. During his time at VP26, he served as the Avionics Branch Officer, Weapons Training Officer, and NFO Training Officer. Additionally, Commander Howe was qualified as a P-3C Tactical Coordinator, Mission Commander, Instructor NAVCOM/TACCO, and squadron NFO NATOPS Evaluator. His next assignment was to the “Pioneers” of Air Test and Evaluation Squadron ONE (VX-1) at NAS Patuxent River, Maryland from April 2004 to May 2006. There he served as the Model Manager for all P-3C tactical publications, the P-3C Commercial Obsolescence Program, P-3C NFO NATOPS and Training Officer, and the Operational Test Lead for the ALR-95(v)2. From June 2006 to July 2008, Commander Howe served onboard USS THEODORE ROOSEVELT as a Tactical Action Officer, OI Division Officer, Air Defense Officer, and TAO Training Officer. Commander Howe attended the Air Command and Staff College at Maxwell Air Force Base, Alabama from August 2008 until July 2009 where he received a Master’s degree in Military Operational Arts and Sciences. He reported to the VP-47 “Golden Swordsmen” in MCAS Kaneohe Bay, Hawaii from December 2009 to December 2011. There he served as the Administrative Officer, Training Officer, and Operations Officer. In January of 2012, Commander Howe returned to VX-1 to serve as the Assistant Operational Test Director for the P-8A Poseidon Test Program. As the lead NFO on the test effort, he was responsible for the test and evaluation of all P-8A sensor, weapon, and mission systems. He reported in January 2015 to the USS GEORGE WASHINGTON, forward deployed in Yokosuka, Japan. Serving as the Combat Direction Center Officer and Operations Officer, he helped to plan and execute the historic three-CVN hull swap, as well as the “Southern Seas” deployment and homeport shift to Norfolk, Virginia. Commander Howe is authorized to wear the Meritorious Service Medal (one gold star), the Navy Commendation Medal (three gold stars), the Navy Achievement Medal, and other organization and personal awards.